Socks. A half dead bunch of garage flowers. Things I don’t need and will not use. It’s not just husbands that buy gifts that we just don’t want or need, its mums, dads and brothers. We have all been guilty of scrambling around the store with empty lists or making a panic buy. So how do you pick the perfect Christmas present? I always say that I would prefer one ‘good’ gift to lots of gimmicky presents that will be put in the back of the cupboard. As a child I hated it when I was given bubble bath and things to eat. These are now the best gifts I can be given as I rarely treat myself. For the festive season we favour buys under £100 that are a range of shapes and sizes, perfect for stocking fillers. 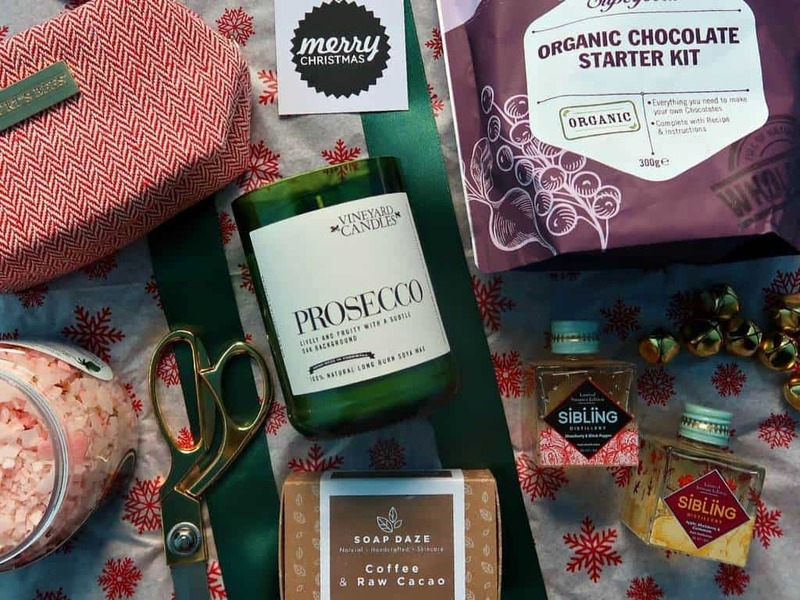 So here are our top 12 gift choices, one for every day of Christmas! For the art lover, I would choose this unique ‘Stolen Form’ vase. It’s slip cast earthenware and contemporary design makes it the perfect home accessory. A gift staple, I always get given flowers and never have anything but a pint glass to put them in. For variety, the vase is available in six colours and the square shape means it can hold a large bouquet. We chose the grey (to match everything I own) and were really impressed by how sturdy it was. You may think flowers are the main attraction but with this centrepiece, in the design of a London brick, it looks perfect on the fireplace or on the kitchen table. It sells for £33.95 and you can buy it HERE and get 15% off your first order. For those whose make up box is feeling tired, I would choose the Burt’s Bees Beauty Basics Bag. From the 2018 Christmas Gift Collection Burt’s Bees is a well reputed brand that offers quality natural beauty and skincare items that are not tested on animals. The beautifully made fabric bag is perfect for travelling and decorated in red and gold for the season. Inside you will find Beeswax Lip Balm, Hibiscus Tinted Lip Balm, Sedona Sands Lip Crayon & White Tea Facial Towelettes. With an RRP of £17.99 the set is on sale for £13.60 a bargain if ever I saw one! For the lady who loves bubbles, I would choose this personalised Italian bottle of Prosecco. Perfect for adding some sparkle to a special occasion this custom 750 ml bottle is better than buying a plain boring beverage from Tesco. Put in some thought to create a special label for your loved one that once the Prosecco has been happily drunk, they can use as a candle holder or book end. With a no hassle order and delivery, you won’t even have to gift wrap this as it is perfectly presented in a gold gift box and wrapped in gold tissue paper. Currently on sale with 30% off at £17.99 grab it before it is gone HERE. For the woman who wants EVERYTHING! She broke her kettle, needs some new clothes. She needs practical gifts but would never buy them herself. She is me! Want to get everything in one place? Then check out JML’s popular Christmas picks. My mum needs a new iron and the Phoenix Gold FreeFlight is Cordless (for unrestricted movement and safety), is lightweight, has an auto-off safety setting, anti calc function, heats up in 30 seconds and boasts a steam burst. The 2400W ceramic face is non-stick and gets creases out quickly. In short it has all the features of a high-end product without the huge price tag. Boring! I hear you say? Not so. One fifty something year old woman is going to be really excited about this. Don’t make the mistake of thinking all gifts have to be a surprise, I like being asked for what I would like! It beats being given incontinence pads which yes has happened before, and yes it was a joke. I hope. Do you ever buy your own gifts? I have been wanting some new leggings for a long while but have no time to get to the high street stores to try anything on. Now JML would not have been my first thought of where to buy clothes but the Hollywood Pants waist shapers are fantastic! They are soft, well fitted, and do what they say on the box. The high, double layer waist is comfortable, the material thick but breathable so they can be worn in all seasons. The leggings are versatile; having different decorations for both day and evening wear and can tuck in or tuck under clothes. You can wear the pull on, tapered-leg pants with confidence and regardless of your body type, you’ll likely be able to find a pair that’ll flex to fit your shape. Buy three pairs for just £39.98 and you will see they are way better choice than your regular tummy shaper underwear! Without fail in Boots every year there will be on sale a No7 beauty magnifying mirror. Perfect for applying make-up and tweezing eyebrows, each time I consider that it would be useful. Each year I don’t buy it as it is too expensive. You buy own brand in Tesco so why is a different brand but the same product any different than say, your lasagne sauce. Like me, the lady who loves beauty accessories will need the flawless folding LED magnifying mirror. It is lightweight, fits in your handbag and is battery powered for convenience. Its twisting joint and collapsible stand make it the perfect compact mirror and retailing for £19.99 why not spoil her and buy those earrings she loves and hide them in the handy compartment? For the chocolate lover, I would choose this gorgeous Chocolate Making Starter Kit. We all love chocolate but not all of us can munch through a £3 box of Dairy Milk. For a vegan, gluten-free, low GI, pure cacao option Indigo Herbs have this beautifully presented kit that makes 20 small chocolates with an easy to follow recipe & instructions. Instead of a bucket load of refined sugar these are sweetened by organic agave syrup. Filled with such high-quality ingredients these glossy, rich treats are delicious but also nutritious. Perfect for the family to make together the chocolates will stay fresh if sealed & refrigerated for 12 weeks (but we bet they will only last one!) Retailing at £12.99 you can buy the kit HERE. For the woman who has everything! She has jewellery, she has wine, so what do you buy? Drink in the glow from this Vineyard candle. Beautifully scented high-end candles are one of my favourites presents to be given. We just love candles! A glass jar that soothingly illuminates a dark room is the perfect partner to the cold season. Move over Yankee as this beautifully packaged Prosecco candle smells gently of rose and grapefruit. Made from a re purposed wine bottle and natural soya wax it boasts 80+ hours of burn time and will sit perfectly on the side of a bubble bath to calm and comfort. Selling for £17.99 and available HERE it is our must buy item of Christmas! For those in need of some ‘me time’, I would choose these sweetly fragranced Malki Dead Sea aromatherapy bath salts. A must have for any bath a little goes a long way to leave you calm and tense muscles soothed. You lift the lid and are met with the scent of Frankincense oil & Rose petals to relive stress and have skin left radiant after gentle exfoliation. You can buy these from Boots HERE for £6.85 for a slice of therapeutic bliss. Buy for your wife, your mum, your sister, her sister in law and your kids’ teacher. It is the perfect all-rounder gift. For the foodie, as we have all become Mary Berry fans, I would choose the Bake-Off organiser to keep your family in check and a Salter Cactus Kitchen scales. A dynamic duo of two fantastic home buys. Wall calendars are essential when trying to juggle hectic lives and are the perfect buy for busy mums. I scribble on meal plans and this is the perfect size and gives a whole column to each family member to mark appointments and reminders as well as lots of fun stickers and a handy drop-down pocket, to store receipts and vouchers in. My pet hates? Ugly calendars and diaries, stationary they you look at daily and are often on display. Pick a good one! With an RRP £9.99 you can order it HERE. Succulents are the current trendy and if you want accuracy in your measurements when whipping up cakes then this is the perfect buy. Best of all it measures liquids for you and comes with a huge 15-year guarantee. Salter helps you save time in the kitchen with the “Add & Weigh” function so you can throw all of your ingredients into the same bowl. That’s my type of cooking. It is easy to wipe clean, lightweight and the perfect size. Buy it HERE for fuss free baking! For the lady who likes to be cosy and stylish, I would choose these Fairisle Donkey Gloves. Perfect for the cold weather, these soft gloves boast a traditional style pattern with an adorable donkey. Retailing for £10.50 they are available to buy HERE from The Donkey Sanctuary, an international animal welfare charity who have given lifelong care to thousands of donkeys and mules at their sanctuaries in the UK and Europe and reach many more through their work across the world. One of our favourite places to visit is the local sanctuary in Sidmouth and if gloves aren’t enough why not adopt a donkey for a loved one this Christmas to give a gift that goes a long way. For the lady that loves quality, I would choose these lovely So Eco Make up brushes. You may have been previously bought a new lipstick or some sparkly eyeshadow, but high-quality makeup brushes are designed to last for years. They make application easier and make up more professional looking so are a better buy! A perfect addition to your make up bag for the Christmas season this set also has the benefit of being a sustainable and ethical gift. The PETA accredited, cruelty-free and vegan-friendly Angled Contour Brush, Tapered Blending Brush, Round Foundation, Lip Brush and dual-purpose cotton case stand are 100% ethically sourced and wonderfully soft on the skin. With an RRP of £20 they are a bargain price and available HERE. Have you got your eye on that perfect Christmas present? Do you like useful presents or luxury presents? Or how many pairs of socks do you recon you will be given this year? Note: We were kindly gifted these items to include within the Guide and were not paid or endorsed to feature items #AD. I love the look of those leggings too. I wouldn’t have thought of shopping from JML from them.